Designer of Crushed bowls Julien de Smedt on the design: “The Crushed bowls show big-scale architecture applied on small scale objects. 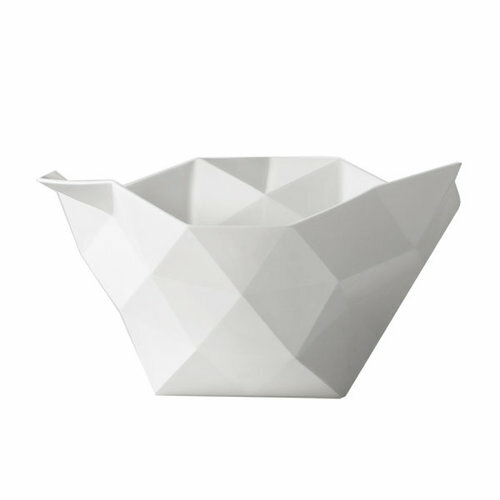 The bowls are composed of equilateral triangles and principles we use for big-scale computer modeling. Adding human ergonomics and aesthetics to the equation we have derived a series of vessels that are carefully crushed for everyday use"
JDS Architects a.k.a. Julien De Smedt Architects is a versatile design office which is focused on architecture, design, urban planning, furniture and utensils. The design office established by Julien De Smedt (b. 1975) in 2006 employs a large group of talented designers and architects. There are three offices situated in Copenhagen, Oslo and Brussels. JDS Architects have designed amongst other things a kindergarten to Copenhagen, a ski jump tower to Oslo and several residential buildings and public spaces around the world. When it comes to product design the office has designed the Stacked shelving system and the Crushed bowls for Muuto.